Available in Française, Español, Português, Deutsch, Россию, 中文, 日本, and other languages, provided your browser has an enabled Flash plug-in. his is a virtual museum of early aviation that tells the story of the Wright brothers, the invention of the airplane, and man's first flights. Although we focus on the accomplishments of Wilbur and Orville Wright, that's not all we offer. The birth of aviation, aeronautics, and the aerospace industry was a long process, lasting over a century from 1799 to 1914. It involved not just the Wright brothers, but the courage and creativity of many men and women spanning several generations and many nations. Since 2000, we have been adding and refining information at this site to tell the story in its entirety. Nor is this just an historical museum. 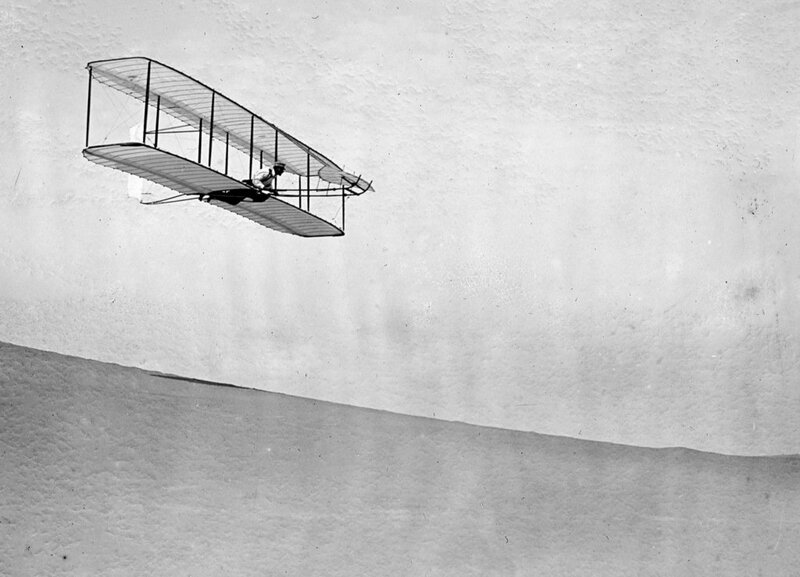 The Wright Brothers Aeroplane Company is an educational institution whose mission is to teach the science, technology, and mathematics on which aviation is founded as well as its early history. And strictly speaking, we aren't historians. We are experimental archaeologists – we study history by repeating it. 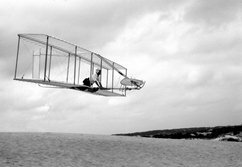 We are the first group since the Wright brothers themselves to build and test all of the Wright experimental aircraft leading to the first practical airplane. We do so for three reasons: (1) It gives us a unique and in-depth understanding of the invention of the airplane, (2) the young people for whom we have built this museum would rather participate in test flights than just read about the history of flying, and (3) it's an incredible amount of fun. The information in this web site relates our own experiences as well those of the pioneer aviators we study. The "exhibits" in this virtual museum are organized in several sections, each of which is further divided so you can find what you want easily. Seeing double? Not quite. The top photo is Wilbur Wright gliding in October 1902. The bottom is of US Navy test pilot Lt. Cdr. Klas Ohman flying a WBAC replica exactly 100 years later. This what experimental archaeology is all about – we study aviation history by repeating it. History Wing – Follows the lives of Wilbur and Orville Wright and the development of the fixed-wing airplane, from its first scientific description in 1799 to the first inherently stable powered aircraft built just before World War 1. 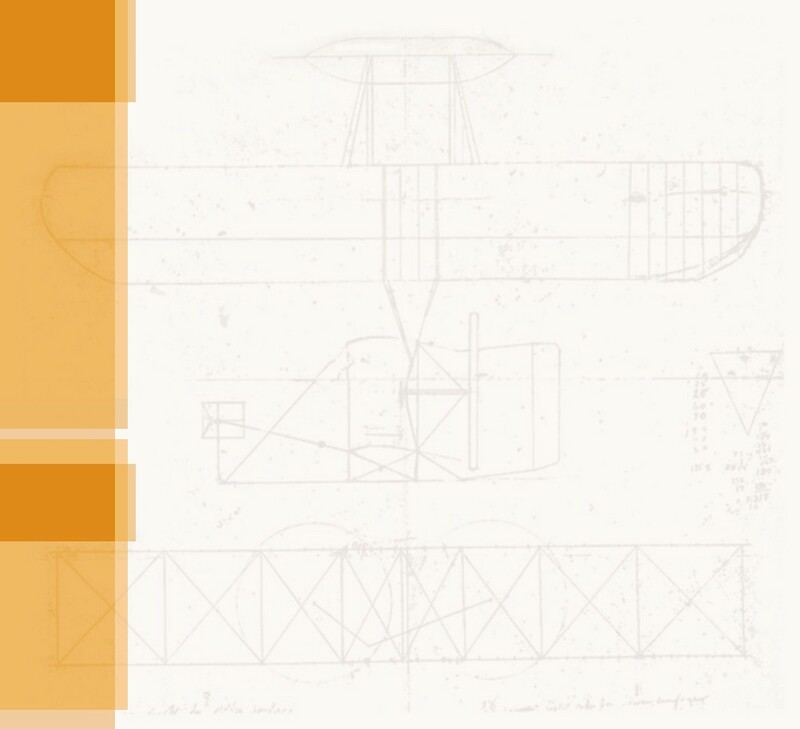 The Wright Story – A "layered" biography of the Wright brothers, organized so you can glean as much or as little information as you want about each phase of their lives. A History of the Airplane – Annotated timeline leading up to and on beyond the invention of the airplane. Also offers biographies of other aviation pioneers and accounts of early aviation events. Aviation's Attic – A mix of the more interesting, intriguing and unusual stories and information from early aviation. 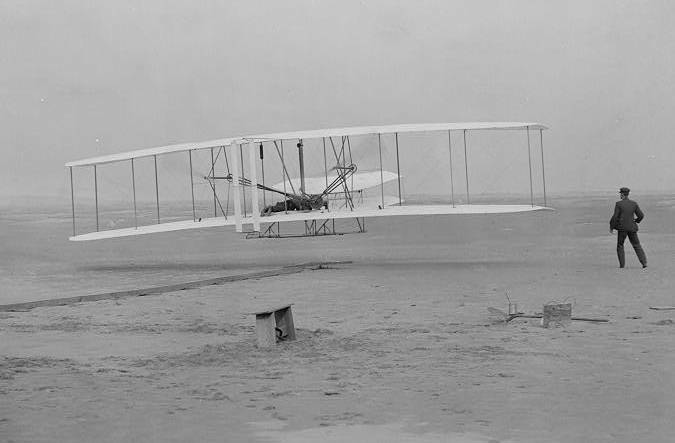 Orville Wright, with his brother Wilbur looking on, makes the first sustained and controlled powered flight on December 17, 1903. Will & Orv's Workshop – Plans and instructions for flying models and aeronautic experiments you can perform to better follow and understand the invention of the airplane. Return to Kitty Hawk – Accounts of the WBAC expeditions in aviation archaeology, how we built and flew the Wright experimental aircraft. Virtual Hangar – Photos of Wright aircraft replicas, taken so you can do a virtual "walk-around," inspecting the Flyers and gliders from all angles. Expeditions	– Visiting the monuments and museums that commemorate early aviation events, as well as the places where those events happened. US Army Apache pilot Cpt. Tanya Markow makes a test run in our 1903 Flyer during the Centennial of Flight in 2003. Exhibits & Programs – Describes the non-virtual part of of museum -- our touring exhibitions and demonstrations for museums and air shows, proficiency-oriented school programs, even a program that lets young people participate in the construction of the Wright airplanes. The Secret of Flight – An exhibit (including a full-size Wright aircraft), coupled with presentations and workshops, designed especially for schools. Birth of Aviation Exhibition – Mix and match our replicas, flight simulators, and interactive displays to create a temporary exhibit especially for your museum or institution. Do-It-Yourself Flyer – Let us work with the young people and celebrities in your area to create a precise replica of a Wright Flyer (and a lot of good PR) for your museum. Past Successes – Summaries and reviews of the programs we've completed. One of our Wright Flyer replicas now hangs in the Dayton International Airport. This "Centennial Flyer" carries the signatures of over 300 kids who helped build it. Company Store – We sell some cool stuff – and what aviation enthusiast wouldn't want a personal item from the granddaddy of all aviation companies? Besides, the proceeds of these sales help support our educational programs – and what aviation enthusiast wouldn't want to help us inspire kids to pursue careers in aerospace? 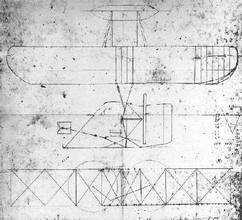 Plans – The results of our painstaking research into the designs and construction methods of the Wright brothers. Many of these are suitable for framing. Publications – Books, posters, art prints and other published media concerning the Wright brothers and pioneer aviation. The Big Stuff – Just a reminder that we also offer entertaining and educational programs, presentation, exhibits, and demonstration. We will also replicate any Wright aircraft or part of a Wright aircraft for you. About Our Plans – How we used methods borrowed from experimental archaeology to generate the most historically accurate plans and blueprints you are likely to find. Terms and Conditions – The legal stuff you have to publish when engaged in e-commerce. Would you like to wear one of our "Wright Brothers Aeroplane Company" logos? We can help with that. Wright Resources – Pioneer aviation publications, movies, archives, and links to other web sites. Help With Homework – Timelines, photos, and other stuff you can use to write a report on the Wright brothers or develop a History Day project. Just the Facts – A quick reference for facts concerning the Wright brother sand their airplanes. Look around, enjoy yourselves, and come back often. Please excuse our construction in some areas. Like the airplane itself, this virtual museum is -- and always will be -- a work in progress. Looking for the best documentary on the Wright brothers? 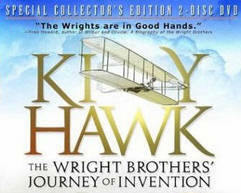 Pick up "Kitty Hawk," and not just because we did the flying for it. It's a truly great film. Photos and Illustrations – To help the information load quickly, most photos and drawings are thumbnailed in the right-hand column. These thumbnails are indicated by a blue border, as shown right. To see an illustration full-size, click on its thumbnail. Use your browser's BACK button to return to the exhibit. Sidebars – Now and then, you will come to a hand pointing to an orange sign. This indicates that we have some in-depth information or interesting trivia to share with you, should you be curious. Usually, this information concerns aviation history. Oftentimes, it will let you in on the "back story" behind an aviation event so you can better understand it. It may also relate Wright trivia and background information to help you better understand the accomplishments of Wilbur and Orville Wright. Or, it may contain historical and scientific facts that help you better understand a pioneer aviation event or breakthrough. Click on the sign and a small box will pop up. To remove the box, click the "X" in the upper right-hand corner and the box will close. IMPORTANT NOTE! Some of our virtual exhibits such as the pop-up sidebars may not work unless your browser is set to allow active content. Navigation – To find your way around this huge museum, refer to our Site Map as you need them. You can also consult our Museum Index for directions. To locate specific information or illustrations, you can do a key-word search at Search the Museum. Translation – Most of our pages are available in over 50 different languages. To provide this service, we use the Google Translation Element. Look for the translation toolbar near the top of each page, usually right before the text begins. Click on the arrow and a list of languages will appear. Choose the language you would like to read and the translation will begin immediately. We apologize for any mistakes in grammar or nuance, but this is a robotic translator. Important note: In order for the Google translator to work, you browser must have a Flash plug-in and it must be enabled. 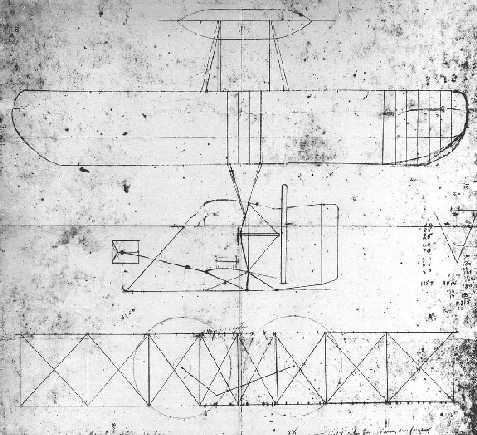 The Wrights sketched their first powered aircraft – the 1903 Flyer – on brown wrapping paper. We've used this sketch as wallpaper throughout the museum. Location – As mentioned on our Home Page and the Museum Entrance, this is a virtual museum. Although we have airplanes, artifacts, and displays that we bring to schools and museums, we don't have a location of our own. On this matter, we are open to suggestions. Please see A Unique Opportunity. Host – This virtual museum is maintained by Bookworks, Inc. as a service for the Wright Brothers Aeroplane Company, an educational organization composed of teachers, pilots, scientists, and aviation enthusiasts who use the story of the Wright Brothers to inspire young people and get them thinking about making their own contributions to science, technology, engineering, and mathematics. Copyright © 1999 - 2011 – The text, contemporary photos, contemporary illustrations (including engineering drawings), photomontages, and contemporary videos in this web site are the copyrighted property of Bookworks, Inc. unless otherwise indicated. They may not be duplicated without written permission of the copyright holder. 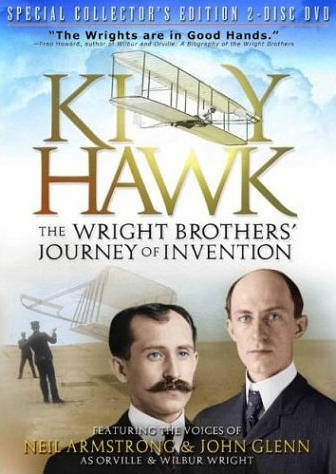 Trademark ™ – The Wright Brothers Aeroplane Company trademark (reproduced to the right) is the property of Bookworks, Inc. and may not be duplicated without written permission of the trademark owner.